CUMBERLAND A4 Refillable Display Books. Features 20 clear, durable, anti-static, acid free pockets with colour cover and matching coloured spine. CUMBERLAND A4 Refillable Display Books in 6 classy gloss colours. Features 20 clear, durable, anti-static, acid free pockets with gloss finish colour cover and matching coloured spine. A4 Refillable display book with unique Kwik Zip® action allows you to easily add, remove & interchange pages as required. Features insert front cover to showcase your presentation and 5-Tab pocket dividers with insert tabs. Extra wide display book to house dividers and bulky papers. Includes 10 clear, durable pockets to protect documents. Available with 10 fixed pages in Black or Navy Blue. Premium quality fixed 20 Pocket A4 Copy Safe Display Books with Insert Cover and Spine. Available with 20 fixed pages in Black or Navy Blue. 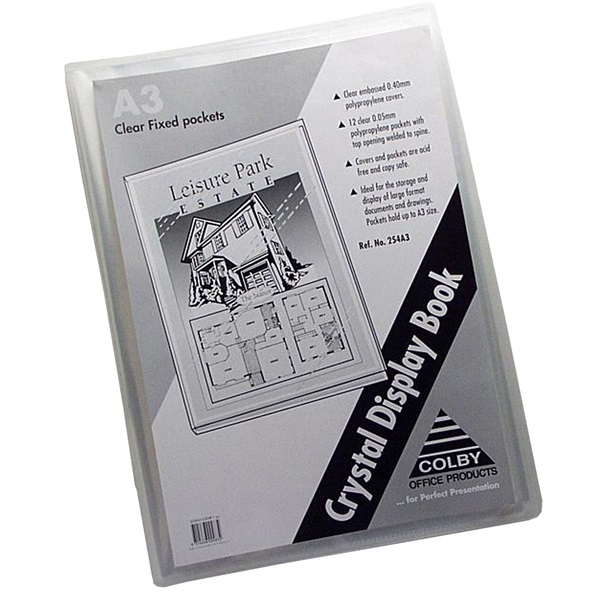 Premium quality fixed 40 Pocket A4 Copy Safe Display Books with Insert Cover and Spine. Available with 40 fixed pages in Black or Navy Blue.